Lately Spouse and I have taken to watching so-called reality television shows that involve buying and selling (aka flipping) houses, or of homeowners who must choose between loving the improvements done on their current home or listing it and purchasing a new place that would better suit their needs. What I want to know is how the couples that flip houses can possibly get along together during an entire renovation. Spouse and I barely get through a conversation about replacing the bathroom tiles without one of us stomping off and mumbling something about what the other can do with that tub faucet. Another thing - how do people walk into a building and immediately envision walls moved, rooms added and a family playing Scrabble in the currently nonexistent family room? I can’t even picture what the kitchen table looks like under the junk mail. The series about loving the house renovations or listing it always starts the same. The homeowners offer a designer half a zillion dollars to make renovations in their home, and they hand her a to-do list. Often it will include adding at least one bathroom, expanding the kitchen and making the first floor an open concept design. The couple will then meet with a realtor, tell him they can spend a zillion and twenty dollars on a new home, and discuss what features they are looking for. This might include as many bathrooms as there are bedrooms, room for a man cave and a huge backyard. Most important, it would have to be a turnkey home - absolutely no improvement needed. This is when the good spouse-bad spouse games begin. Inevitably one of the pair will announce that they have no intention of departing from their lovely, quaint home and perfect neighborhood, and are convinced it will be next to impossible for the realtor to find exactly what they need. The other half will try to logically explain why their current home will never fit their needs, even with the renovation. The challenge is on. Of course, there has to be that moment when the contractor informs the designer about some major construction issue that will eat up close to half of their budget, thereby changing at least some of their plans from add-and-renovate to overhaul-and-repair. Mild arguments ensue between homeowners and designer, often resulting with one of the homeowners unhappy about an upgrade they had to give up just to keep something trivial like, oh, I don’t know – plumbing perhaps. I know you’ll find this shocking, but Spouse and I don’t have a zillion dollars or even half that. We won’t be planning major home renovations any time soon, and we most likely won’t be moving to a bigger home in this lifetime. I will admit our little house does lack a few conveniences - closet space, counter space, and just plain old space. Let’s imagine how the designer and realtor would react to our reality. The designer would ask how much money we will be investing for renovations on our home. We would give her a sincere answer. She would stare at us in shock, swipe the kitchen counter with a wet washcloth, and announce that the renovations are done. 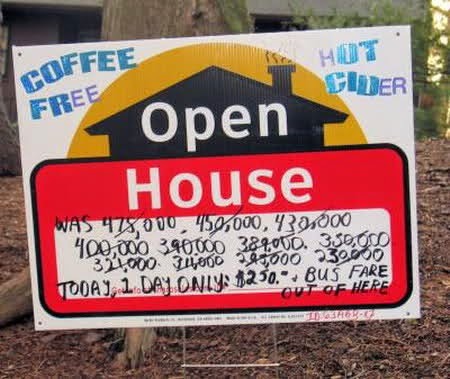 The realtor would want to know what kind of a budget he is working with while looking for our new perfect residence. We give him a figure. An ambulance has to be called after he repeatedly smacks his head on a beam in our unfinished basement. We realize when watching these episodes that their reality may not be ours. An episode about upgrading or selling our house would be more along the lines of “Shoveling Out the Hovel” or “The Price is Right if You Don’t Mind that Hole in the Ceiling.” Really, who needs a zillion bucks when you have your sense of humor? Unless, of course, that’s your offer.